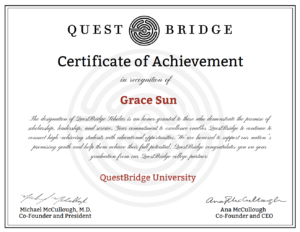 We are excited to announce this month’s winner of the Certificate of the Month Program, Grace Sun of QuestBridge. QuestBridge is a national non-profit that connects the nation’s most exceptional, low-income youth with leading institutions of higher education and further life opportunities. By recruiting, developing, and motivating these students — beginning in high school through college to their early career — QuestBridge aims to increase the percentage of talented low-income students attending the nation’s best colleges and to support them to achieve success in their respective careers and communities. QuestBridge uses SimpleCert to celebrate the achievements of its’ QuestBridge Scholars, many of whom receive full four-year scholarships from college partners. Certificates are sent directly to students, who can share their successes with friends, family, and educators who supported them. Educators sometimes print out the certificates, and present them to the students at award ceremonies. Similar to August 2017 Certificate of the Month Winner, Grace also utilizes multiple Certificate Templates with their respective Email Templates (CertSets), which allow her to create unique certificates for specific courses that students graduate from. We salute QuestBridge for its work, and positive impact on low-income students across the country – and it’s our honor to be able to support QuestBridge in our own small way. Thank you Grace for truly being a valued member of the SimpleCert Community, and congratulations again!